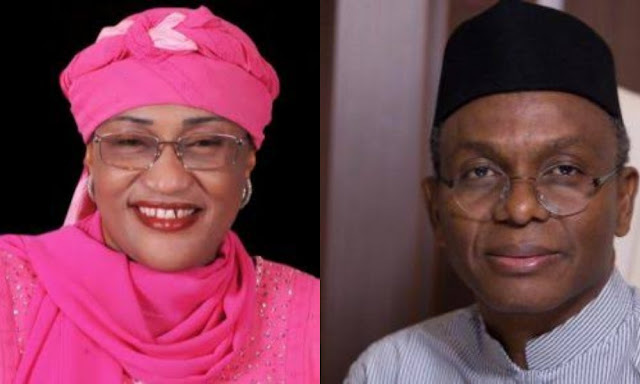 The embattled Minister of Women Affairs, Amina Alhassan has threatened to expose Kaduna State Governor, Mallam Nasir Elrufai and his role in Chibok girls kidnapping. The Minister said she was surprised that a dirty character like Elrufai could even have the gut to comment against her preference for Alhaji Atiku Abubakar for 2019 Presidential race. She said, there are lot of things Nigerians needs to know about the planning and execution of Chibok girl kidnapping because those behind it will be unmasked very soon. The intention was very obvious, to defame and blackmail PDP and Jonathan out of power. The Minister became angry by the comment credited to Elrufai where he was quoted as saying that Buhari was severely warned not to appoint Amina Alhassan as Minister. Mallam Elrufai said Amina Alhassan's leaved Video, an indication that she has never been loyal to President Buhari from day one, noting that her loyalty lies with someone who is not even ready to support the party to success just because the person also want to become a president In her response, Amina said those who know history well could tell about the treacherous nature of Elrufai who can go to any length to stab anyone just to rise politically, she said Elrufai was a nobody who was as poor as church rat if not for Atiku that brought him to political relevance. The same Elrufai was among those who plotted against Jonathan by tactically supporting Boko Haram and Kidnapping of Chibok girls, the information is out there where he lied that Jonathan wanted to kill him and other top members of APC by raising a false alarm about sniper list. No sane Nigerians will take Elrufai serious because he is an unrepentant addicted liar. The same Elrufai who claimed to be loyal to president is sponsoring some bloggers and his errand boys in the media to keep attacking and defaming Buhari, at least Nigerians and our party can see his deliberate action to blackmail the President when he released his memo to the media which was supposed to be a confidential memo to the President in his bid to tarnish and embarrass Baba Buhari. I am not a coward, Buhari is my President and one of the fathers of my party APC, if I can't be real with my choice of Atiku, then it would amount to eye service, I am not that kind of person. Former President Obasanjo through his book "My Watch" gave a valid description of who the midget Elrufai is, he thrives on stabbing the hands that fed him just to rise politically, he can lie and kill so far he will rise in his political career not minding the pain he is inflicting on others, one of such is his supervision of mass killing and hurriedly burying of over 1,000 Shiites killed in Kaduna. I will personally meet with President Buhari and explain myself to him, I am not afraid of anybody in the party, after all I am a politician, for those who have gone ahead to plant a corruption story about me in the media, you are just wasting your time she added. Trouble in the camp of our enemies. No peace for the wicked. The woman knows thät mad man well.